GRAFENWOEHR, Germany — Two Soldiers have won the right to represent the U.S. Army Installation Management Command in this year’s Army-wide Best Warrior Competition. Sgt. Anthony J. Brown-Davis, IMCOM Readiness, USAG Fort Irwin, was named IMCOM’s NCO of the Year, and Spc. Bryce M. Falgiani, IMCOM Training, USAG West Point, was named IMCOM Soldier of the Year. The awards are based on their performances in the Best Warrior Competition held April 23-26 at two Joint Base San Antonio locations: Camp Bullis, an Army training area northwest of the city, and Fort Sam Houston. Runners-up were Sgt. Jeremy J. Lucena, IMCOM Europe, USAG Bavaria, for NCO of the Year, and Spc. Jacob D. Harrison, IMCOM Readiness, USAG Fort Bliss, for Soldier of the Year. Winners and runners-up were announced at an awards ceremony April 26 at the Fort Sam Houston Theater. Eight of IMCOM’s finest warriors ─ two each from four IMCOM directorates ─ faced off to determine who would be named the command’s top noncommissioned officer and top Soldier. 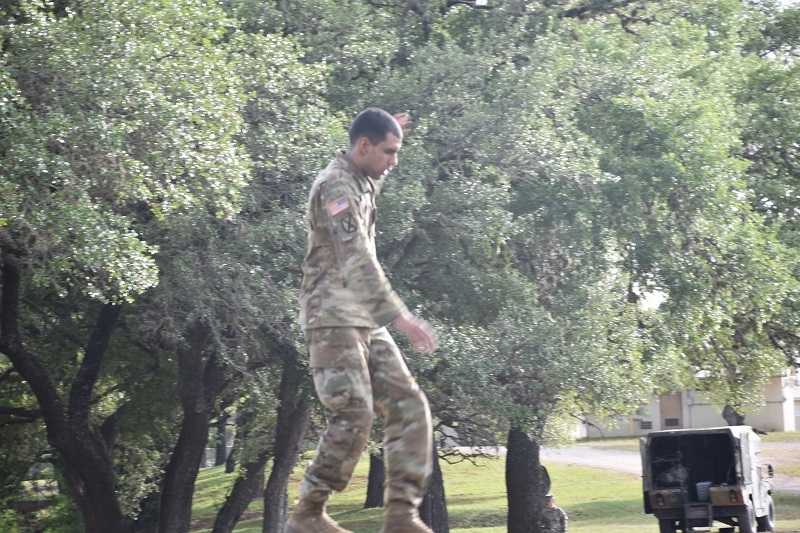 Before arriving in San Antonio, the eight IMCOM participants had advanced through Best Warrior competitions within their directorates. The competition is designed to promote morale and cohesion within participating commands while enhancing Soldier readiness and resiliency. Best Warrior events test Soldiers’ physical abilities in warrior tasks, urban warfare simulations, fitness tests and battle drills, as well as their Army aptitude through interviews and essays. Individual competitors are scored on a variety of specific tasks, including day and night land navigation, a 12-mile ruck march, range qualification for the M16 rifle and 9-millimeter pistol, face camouflage, assembling and operating a field radio, an obstacle course and other challenges. The other 2018 IMCOM competitors also were acknowledged at the awards ceremony: IMCOM Europe, Spc. Jacqueline A. Delgado, USAG Benelux; IMCOM Pacific, Cpl. Rebecca N. Dennis and Pfc. Thomas U. Massengill, both from USAG Daegu; and IMCOM Training, Sgt. Justin C. Howard, USAG Fort Rucker. In addition to the eight IMCOM participants, 11 additional soldiers from Army North and Army South took part in the four-day competition. The two top IMCOM winners will represent the command at the next round of the Best Warrior competition, scheduled for June in San Antonio, with Army North as the sponsor. The finals will be held this fall at Fort A.P. Hill in Virginia, earning the winners the titles of 2018 Department of the Army NCO of the Year and Soldier of the Year. Maj. Gen. Sean M. Jenkins, IMCOM deputy commanding general, commended the Soldiers for being IMCOM’s best warriors. “They demonstrated the highest level of proficiency in all soldier skills, unequaled physical and mental toughness, outstanding oral and written communication, and impeccable leadership skills,” Jenkins said. Brown-Davis and Falgiani were awarded Army commendation medals, trophies and an assortment of gifts. Competitors from other Army commands who participated in the April 23-26 Best Warrior events at Camp Bullis and Fort Sam Houston included: Spc. Brian Bull and Sgt. Arnulfo Navarro, U.S. Army North; Staff Sgt. Ryan Figuerra and Spc. Deborah Smith, U.S. Army South; Staff Sgt. Devin Alderman, Staff Sgt. Chavis Avery, Sgt. Kevin Carter, Pfc. Michael Hardway, Sgt. Shadira Lamby, Spc. Jacob Larson and Spc. Morgyn Peele, U.S. Army South/470th Military Intelligence Brigade.